330 ml capacity for every down stroke. 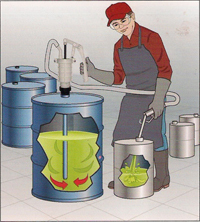 Excellent for transfer of acids, alkalis and other corrosive chemicals form barrels and jerry cans. Self-priming with trlescopic suction pipe to suit 100 LTR. To 210 LTR. Drum. Dual htreading for steeel and plastic drums. Economical light weight and durable. Easy to dismantle, clean and reassemble. Container emptying is accomplished quickly, efficiently and safely with DAYBREAK protable hand drum pumps. Utilizing DAYBREAK drum pumps, containers are filed or emptied without messy spills and aplashes. Operator contact or exposure to potentially harmful materials is avoided . ALL DAYBREAK pumps are desigened with the user in mind . Compact, impact-resistant housing have integral, comfort-grip handles. DAYBREAK has been a leading designer and manufacturer of various pumps since 1992. Strict process controls and an ISO 9001 Quality System assure consistency of product quality. Inventoried and sold through worldwide distribution, DAYBREAK drum pumps are available for immediate delivery. 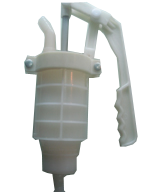 Atypical pump user will find the DAYBREAK drum pump a viable replacement for pouring & diaphragm pumps. 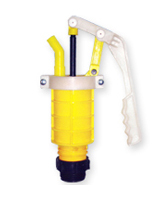 Drum pumps are easier to use, more mobile and less costly to operate. LState-of-the-art magnetic technology provides a safe and reliable pump for difficult applications. A magnetic coupling consists of two magnet assemblies. One is the outer assembly (the drive magnet) and other is the inner assembly (the driven magnet). The outer assembly is connected to a motor and the inner assembly is directly attached to a pump impeller. When load is applied, the coupling effects angularly and magnets create a force which is used to transfer torque from the motor to the impeller. 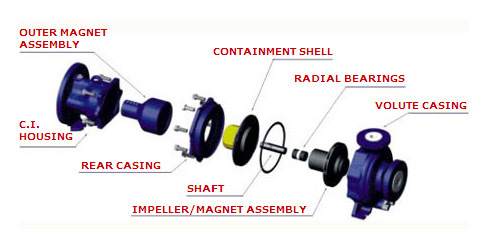 This permanent magnet coupling creates neither slippage nor induction current during rotation. There is no energy loss in this permanent - permanent magnet coupling. 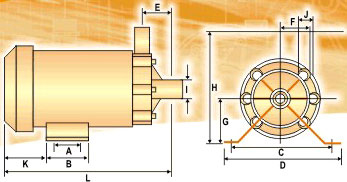 'Daybreak' pumps have an inner magnet assembly which is directly molded into the impeller. Daybreak offers magnetic drive chemical pumps which safety handle hazardous, highly corrosive, explosive and toxic chemicals. They provide safe, leak proof service because the magnetic coupling eliminates the need for traditional sealing methods, such as mechanical seals or gland packing. 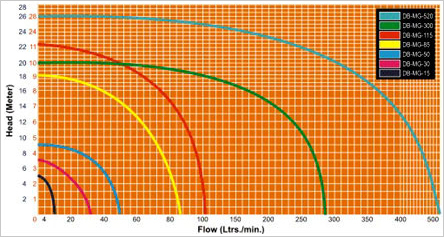 Which is the main source of leakage problems on pumps. As a result, down time and maintenance cost are greatly reduced. And there are no warn signs to replace. Daybreak' Magnetic drive chemical process pumps offer many benefits. Minimizes exposure of your personnel to hazardous chemicals. Eliminates contacting seal faces which are prone to wear and leakage. Eliminates costly seal flush systems required on all pumps with double mechanical seals. Reduces downtime and maintenance costs through extended service intervals. Eliminates alignment problems inherent in direct-coupled units. 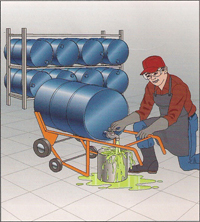 They are ideal for vaccum service and transfer of expensive, toxic, radio active, hazardous and corrosive chemicals. Seal-less features make these pumps perfect for environments subject to federal regulations. Chemical, Pharmaceutical, Textile Processing & Dye Baths Electroplating, Various Metal Rcovery Systems, Metal Finishing, Color Photo Procesing, T.V.Tube Processing, Food Processing: Dairies, Soft Drinks, Beverages, X-Ray Film, IC Photo Engraving Process/PCB Plants, Refrigeration & Chilling Plants,Water Treatment Plants, Galvanizing/Anodizing Plating Plants, Etching/Spark Erosion Machines & many more....where pump leakage must be avoided.